PennDOT and the Pennsylvania State Police today urged motorists to “steer clear” of police, emergency responders, road crews and tow-truck operators while they carry out their duties. In October, a state police trooper was severely injured while removing debris from Route 119 in Westmoreland County. The marked patrol car was positioned so that it blocked the right lane of the roadway, moving traffic into the left lane. As the trooper began removing the debris from the roadway an SUV approached the slowed traffic from the rear and was unable to stop in time – striking the trooper. Pennsylvania’s Steer Clear Law requires motorists to move to a lane that is not immediately adjacent to an emergency response area. Such areas include locations where police are making traffic stops, where highway or construction workers are involved in emergency assistance, or where tow trucks are responding to disabled vehicles. If drivers cannot move over because of traffic or other conditions, they must proceed at a speed that is “reasonable and prudent,” according to the law. The law applies any time an emergency vehicle has its lights flashing and where road crews or emergency personnel have lighted flares or have posted signs or other traffic control devices. Failure to move over or slow down can result in a summary offense that carries a fine of up to $250. In addition, fines will be doubled for other traffic violations occurring in these areas. If the violation leads to a first responder being injured, a 90-day license suspension could result. For more information on traffic safety in Pennsylvania, visit www.JustDrivePA.com. There will be lane restrictions with flagging on Route 512 between George Street and Glass Street (Between Pen Argyl & Wind Gap) for Crack Sealing, starting December 8 and ending December 10 between 9:00am and 2:00pm each day. There will be lane restrictions with flagging on Route 611 north of Portland from Slateford Road to the Monroe County Line for drainage work between the hours of 9:00am to 2:00pm starting December 8 and ending December 12. There will be lane restrictions on Route 33 north and south between Routes 248 and 191 for milling rumble strips starting Monday December 8 and ending Friday December 12 between 9:00am and 3:00pm each day. Plainfield Township Supervisors - Meets 7:00pm Municipal Building. UNICO - 7pm. Medic 9 building, Blue Valley Drive (Rt 512). One Year on Kythera, photographs by Kristina Williamson. The event, which is free and open to the public, will be held on Thursday, December 11, 2014 from 6:00 to 9:00 p.m. at ﻿The Gap Theater, 47 Broadway, Wind Gap﻿. They are delighted to have the opportunity to share Ms. Williamson’s work with the community. She is a local-born artist, Pen Argyl High School alumna (class of ‘98), and Fulbright Scholar who, in her own words, describes the Slate Belt area as a wealth of inspiration to her work. The evening’s program will feature a presentation by the artist of her work followed by a book signing and wine reception courtesy of ﻿Franklin Hill Vineyards. ﻿A portion of the proceeds of the event will be donated to the Totts Gap Arts Institute Scholarship Fund.. The regular monthly trip sponsored by St. Elizabeth Church in Pen Argyl will be to the Mohegan Sun in Wilkes Barre on Thursday, December 11.. The bus will leave St. Elizabeth's parking lot by 9:00am, there will be second pick up location at the old St. Joseph's parking lot in Wind Gap, leaving by 9:05am. You will receive a voucher for free play and a voucher towards food. For more information, please call Mary Lou DeRea-Lohman at 610-863-4846 or 610-844-4630." Open Mic Night will be held tonight at the Nazareth Center for the Arts at 30 Belvidere Street in Nazareth from 7-9pm. Open Mic Night is held the second Wednesday each month. (BPT) - ‘Tis the season for family gatherings, dinner parties, gift exchanges and the sound of laughter coming from around the table. With the hustle and bustle surrounding the holidays, finding ways to reduce stress can help you survive the season. Here are six simple tips that will help your holidays go from hectic to holly and jolly, with even a little time left over to relax before your guests start arriving. Getting a jump start on your home’s preparations will keep you from burning out early. Clean the house thoroughly a few weeks prior to your big event instead of waiting until the last minute. Check for any light bulbs that need to be replaced, carpet stains that need treatment, and pesky cobwebs in your fixtures. Discard old condiments in the refrigerator and add more to your shopping list. Baking soda and a warm rag left on a glass cook top for 15-minutes leaves your surface sparkling - no elbow grease required. Don’t forget your oven – the self-cleaning option saves you time so you can move on to the next task. While the tradition of celebrating holidays is passed down from one generation to the next, there’s no need to hide your personal flair. Forgo a traditional centerpiece and create a tablescape reflective of your family’s personality instead. To add dimension to your dessert table, glue candlesticks to mismatched plates to create holiday treat pedestals. Only have a few minutes before your guests arrive? Use Krazy Glue Craft Gel to create centerpieces and personalized place settings out of beads, gourds, holiday baubles and handwritten name cards. Even if your handwriting didn’t score an A , your guests will appreciate the special touch. A tchotchke here and garland there can soon lead to decoration overload. Choose a color scheme ahead of time and stick to two or three colors. Decorating with colors that complement your existing decor will bring holiday cheer into your home seamlessly. If you have outdated decorations that you just can’t part with, consider giving them new life with a fresh coat of metallic spray paint. Wrapping gifts with similar colors, ribbons and metallics add the finishing touches to your decorating scheme. For added cost-savings, potato chip bags turned inside-out can be repurposed as metallic wrapping paper or bows. Cut open the empty bag, wash with soap and water and let dry. Then wrap your present and finish with a colorful ribbon or gift tag. Add a few drops of essential pine oil to your air filter to keep your home smelling festive even if you have a fake tree. For a softer scent, boil water and add vanilla extract, rosemary and a few lemon slices. Opt for table lamps in the living room instead of harsh overhead lights. The warm yellow glow will add to the ambiance of candles, fireplaces and twinkling string lights. Finally, have a few family-friendly movies on hand to provide your guests with entertainment and a little down time between dinner and dessert. Tired of losing Tupperware containers to family and friends who forget to return them? Whether it’s Thanksgiving turkey or holiday cookies, you can pack up leftovers in personalized take-out containers and keep your Tupperware safe at home. Pick up an assortment of blank, disposable take-out boxes from your local craft store and apply adhesive labels. Write your guests’ names on the labels and decorate the boxes for the occasion with embellishments and glue. When it’s time to fill each box as your guests prepare to leave, keep a marker and extra labels nearby so you can also write down what treats they’ll find in each container. When the holidays are over, ornaments don’t always find their way back to their original packaging. Wreath bags, ornament organizers, dinner plate containers and string light storage bins keep your decorations safe during the off-season. If you have wrapping paper left over that you’d like to save for next season, cut a toilet paper roll lengthwise and wrap it around the wrapping paper to prevent unraveling. To avoid holiday emergencies next year, keep a small, unopened tube of Krazy Glue’s Maximum Bond formula with the breakable decorations to quickly fix any ornaments, centerpieces or china that might get damaged in storage. Elegant and often extravagant celebrations are at our fingertips in magazines, blogs and on sites like Pinterest and Etsy. The images inspire us to host picture-perfect holiday celebrations, but we can find ourselves in over our heads when it comes time to execute. Remembering these six simple tips will prepare you for a headache-free holiday season. An Australian grandfather is hoping to get into the record books after getting a huge tattoo featuring characters from The Simpsons covering his back. Prison officer Michael Baxter's monster ink job features 203 characters from the long-running animated comedy series. And that puts the 52-year-old in line for the Guinness World Record for the most cartoon character tattoos. Mr Baxter has been into body art for more than a decade but his animation fixation began more recently when he discovered local tattoo artist Jade Baxter-Smith. Ms Baxter-Smith, who works at tattoo studio Twisted By Design, drew each of the Simpsons characters by hand. In total, Mr Baxter spent 130 hours under the needle to complete the design. He also has Stewie from Family Guy on his thigh and various designs on his arms including tributes to his parents and Geelong Football Club. He said: "It's an addiction. Once you get one you want more." But he warned: "Do your research and make sure it's what you want, because it's there for life.". The west bound lane of the Messinger Street Bridge (Viaduct) between First Street (Rte 191) and Murray Street in Bangor has been closed. After a recent inspection it was determined that the westbound lane of the bridge needs to be closed and detoured due to in-creased deterioration to the bridge. Eastbound traffic will not be affected. This restriction will be in effect until construction of the new bridge, estimated to begin in late 2015. Drive north on South Main Street to Broadway thence west on Broadway to First Street (Rte 191). Drive South on South Main Street to Flicksville Road. Turn right and proceed west on Flicksville Road to Route 191. Students from the Northampton Community College’s dance classes, Dance Ensemble and Acta Non Verba dance club will perform pieces choreographed by Northampton Community College dance faculty at a Winter Dance Works event on Thursday, December 11, 11:10 a.m., and on Friday, December 12, 7:30 p.m. The performance will be held in Lipkin Theatre, Kopecek Hall, Main Campus, 3835 Green Pond Road, Bethlehem Township. Admission is free with a donation of a non-perishable food item for a local food bank. For more information about the Winter Dance Works, call 610-861-5300. Friday, December 12th 6:30-8:00 p.m.
Bring your family along to Jacobsburg Environmental Education Center for a craft activity and movie night. We’ll be screening "Bears of the Last Frontier: The Road North" from PBS’ Nature series this month. Craft time starts at 6:30 p.m. and the movie starts promptly at 7:00 p.m. Please register as supplies and seating are limited. To register, contact Lauren Forster at laforster@pa.gov or 610-746-2801. Saturday, December 13th 12:00-4:00 p.m.
Jacobsburg Environmental Education Center is hosting a holiday open house at the visitor center featuring crafts, games and refreshments. Bring your family along to enjoy the holiday festivities! The Jacobsburg Historical Society will be hosting “Christmas at Boulton” concurrently. We encourage you to visit both events by taking part in a natural history walk along the Homestead Trail with educator Rick Wiltraut at 1:00 p.m. The walk will lead you to the Boulton Historic District where you can take part in additional festivities before walking back to the visitor center at 3:00 p.m. with a Jacobsburg historian who will highlight the cultural history along the Henrys Woods Trail. The Christmas Cookie Walk will be held at Ackermanville UMC from 9:00am to 2:00pm Saturday December 13. Their tables will be filled with homemade Christmas cookies which include a great variety and number of Christmas cookies. You buy a box (or boxes) at $10:00 each for a large box, and $5:00 each for a small box, "walk" around the tables, and FILL your box with the cookies you want! See you there! Santa Claus will visit the craft show held at East Bangor Bangor Fire Company at noon Saturday, December 13. The show runs from 11:00am to 3:00pm. Children can enjoy donuts and milk with Santa at 12:30. The fire company will also be selling food and holding a small auction. Vendor tables available by calling 610-588-5996. East Bangor will hold its Christmas Tree Lighting 6:00pm December 13 at the East Bangor Volunteer Fire Company on Route 512. 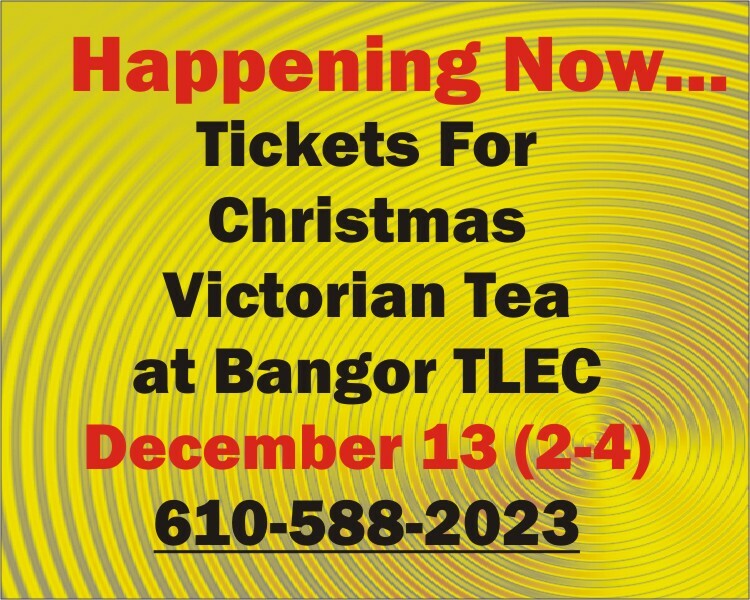 Trinity Evangelical Lutheran Church will hold its tenth annual Christmas Victorian Tea from 2-4 pm Saturday September 13 in the fellowship hall of the church located at Fourth and Broadway in Bangor. Tickets are still available at a cost of $7.00 per person. Call the church office at 610-588-2023 from 9-12 or 1-3 Monday through Thursday to reserve your tickets. Refiner's Fire Ministry announces an open mic night will be held the second Saturday of every month at 6:30pm at the Spark Cafe on Division Street. All talents are welcome. The annual Boulton Christmas Open House in Jacobsburg will be Saturday December 13 from 11-3. The East Bangor United Methodist Community Church will celebrate a "Love Feast" during the worship service on Sunday, December 14 at 9:15 a.m.
A "Love Feast" is a special service of song, prayer and food. Although deriving from the Moravian tradition, the "Love Feast" was brought to the Methodist church by John Wesley in 1738 after traveling to America with the Moravians. During the service Moravian love feast buns and coffee will be served by "dieners". The church is located at 136 W. Central Ave. (Rt. 512), East Bangor, PA. Pastor David Goss welcomes all calls at 610-588-4453, or visit www.ebumc.org. Totts Gap Art Institute's Annual Community Open House will be held Sunday, December 14 starting at 2 PM, TGAI students will share their work with the community. David Blau Author of the Book: “The Blaus and the Holocaust: a Story of Courage, Struggle and Heroism” will be presented via Skype at The Slate Belt Heritage Center, 2:00pm Sunday December 14. Admission Is Free & Donations Are Welcome. The Easton Municipal Band, under the Direction of Jim Freund,will Be Presenting a Holiday Concert of Festive Music at the Williams Center for the Arts, Lafayette College Easton Pa, on December 14, 2014 at 2:00 P.m. the Easton Youth Choir Will Be Performing with the Band on One Number and Will Be Singing Three Selections with Piano Accompaniment under the Direction of Kelley Atwood. Holiday Gift of a Tree Ornament Will Be Give to the First 400 Who Attend. Grace United Methodist Church will sponsor a Community Christmas Cantata on Sunday, December 14 at 3:00 pm. Anyone is welcome to join the cantata practices on Thursday evenings from 7 to 8 pm in the Church’s Chapel on the lower level. 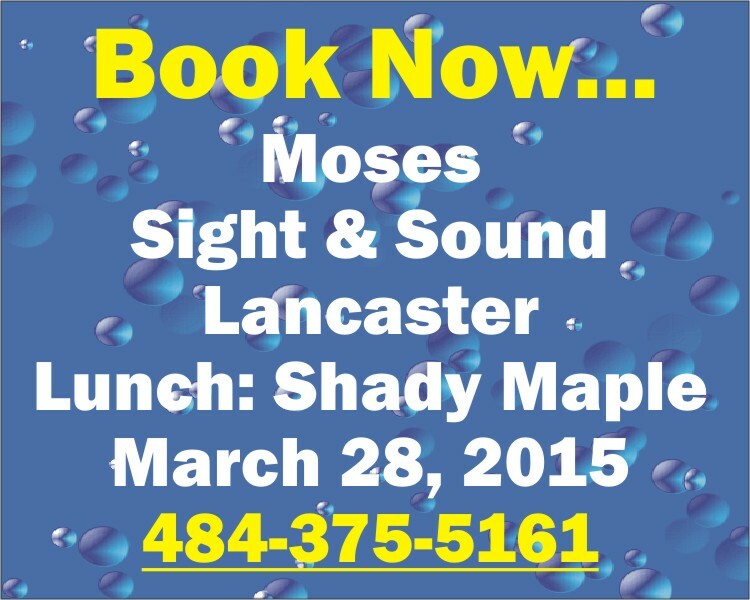 Contact Walt Cole for more information at 610-863-6472. The Bangor High School Girls' Basketball Team fundraiser to fight cancer will be played when the Slaters host Wilson December 16. The Girls' Basketball Coaching Staff picked this opponent because Wilson’s Head Coach, Dennis Fry, has been recently diagnosed with lung cancer and is in the midst of regular chemotherapy and radiation treatments. When they reached out to the Wilson Program., Assistant Coach, Mark Seremula, informed Bangor that compounding Fry's illness further is that these treatments are resulting in heavy, out-of-pocket expenses. The Bangor Girls' Basketball Program and the Lady Slater Bangor Booster Club wishes to help Coach Fry and his family during this difficult stretch. Please come out and support the Lady Slater Basketball Program and their efforts to help offset some of the out-of-pocket expenses for a man who has been coaching in the Lehigh Valley community for the better part of 20 years. Each person is asked to bring a $5.00 exchange gift for the Exchange Gift Game. The Slate Belt Young at Heart club will be having their annual Christmas luncheon on Thursday, December 18,, at St. Elizabeth's Church at 12:00 NOON! This club is open to all, 55 years and older. Thanks to all who attended our annual Veterans and Military Salute! For more information, please call Mary Lou DeRea-Lohman at 610-863-4846 or 610-844-4630. The Marines are coming to Dottas’ December 18 from 5-8 for Toys for Tots. They are coming meet and greet the children, and collect toys for the less fortunate. Santa and his reindeer will be here on his sleigh! Pictures will be taken from 6-close by Kris Ordinsky-Parks Photography. There will be light refreshments for the children, all children will receive a gift for coming, and there will be two door prizes drawn. The door prizes will be divided for gender, one for a girl (from the American girl store in NYC), and one a boy (from FAO Swartz NYC; a Lego set). They hope to see many of you that can come out, and hope all will help fill these boxes with toys from now to the 18 of December! Northampton Community College (NCC) will hold tours of its Main Campus on several upcoming dates. Prospective students and their families are invited to tour the campus, learn about the College’s 100+ academic programs and student life and get answers to their questions from admissions staff. The tour is scheduled for: December 18 at 3:30 p.m. The tours last approximately two hours. The NCC Main Campus is located at 3835 Green Pond Road, in Bethlehem Township. Tours will begin at the Student Enrollment Center. That's Right...Santa Claus is coming to Roseto. Saturday December 20th, Santa will be visting Columbia Fire Co for a special "Breakfast with Santa" event from 9am - 11am. Cost is $5 for adults and children over 10. Children 10 & under are Free. Santa Claus will make his arrival in Bangor Saturday December 20 at the Merchants Bank branch on Route 191 from 10-12pm. This is a departure from the traditional arrival which usually took place the Saturday after Thanksgiving at the downtown Bangor Merchants Bank. Mr. and Mrs. Claus will arrive on a fire truck. Participants will receive a photo. Children will also receive a small gift from Mr. Claus. The cost is $5, which covers the cost of printing the photograph. Come to Columcille on Signal Hill to observe the Winter Solstice. Come to Columcille Sunday, December 21st at 2:00pm for Carols in the Chapel. This is an annual gathering and they invite you to join them to welcome the Holiday Season. Consider this your invitation to join a free group dealing with suffering and sadness during a special quiet worship service called “Blue Christmas”, December 21st from 4-5pm All are welcome, regardless of faith or background. This program is offered by Wendy Littner Thomson, M.Ed., LPC, RYT, and Prince of Peace Evangelical Lutheran Church, 2445 Lake Minsi Drive, Bangor. To register contact Rev. Michael J. Scholtes at 610-588-2355 or pastorMJS@gmail.com. Safe Haven Pet Rescue will hold dog adoption days from 11 - 2 on Sunday, December 21 at Tractor Supply, Route 209, Brodheadsville. Stations—fundamentals such as dribbling, passing, and shooting will be demonstrated then practiced in stations. The East Bangor United Methodist Community Church will have a Christmas Eve "Candlelight Service of Carols" beginning at 7:00 p.m. The church is located at 136 W. Central Ave. (Rt. 512), East Bangor, Pa. For more info, call 610-588-4453, or visit www.ebumc.org. On Sunday November 2, come to Pet Supplies Plus, 101 Pocono Commons, (near Pier 1) Route 611, Stroudsburg from 11- 2. Come on out and meet the adorable, adoptable dogs, cats, and small animals that Boomer’s Angels Animal Rescue has for adoption. Boomer’s Angels Animal Rescue & Care was formed to give as many homeless and downtrodden animals the brightest future possible. All of our adoptions must be pre-approved so why not fill out and application in advance. Visit www.boomersangels.com for an application. If you’re not ready to adopt, why not try fostering? We provide you everything your foster will need. You supply the love and a safe home until they are adopted. Their performances feature the music of the Trans-Siberian Orchestra, as well as their own holiday creations. Twelve Twenty-Four is the Mid-Atlantic region’s original and longest running recreation of the Trans-Siberian Orchestra. With sixteen performers, Twelve Twenty-Four brings alive the magic of Christmas at each show. Get out and get hiking at Jacobsburg on the first day of 2015! Join center educator Lauren Forster for a 2 mile interpretive hike on moderate terrain. We will explore the old growth forest of Henrys Woods. The hikes will start at 10:00 a.m. and 1:00 p.m. from the flag pole in front of the visitor center at 400 Belfast Road. Bring comfortable hiking shoes, a water bottle, and wear layers. Each hike will take approximately two hours. To register, contact Lauren Forster at laforster@pa.gov or 610-746-2801. Ring in the New Year with Trout Unlimited's annual fly tying classes for beginners and intermediate tiers. The eight class course will be held on Mondays at Jacobsburg Environmental Education Center, 6:30 p.m. to 8:00 p.m. The course will end on March 16th (note: we will be skipping the second Monday of each month). To sign up contact Thom Beverly at kbeverly@rcn.com or 610-393-6663. Cost $25. This class is limited to 25 participants, please register in advance. Northampton Community College (NCC) will hold a free information session for its Casino Training Program on Tuesday, January 6, from 6:00 to 8:00 p.m., at the Fowler Family Southside Center, Room 621. The interactive session will provide the information needed to launch a successful career in one of the fastest growing industries in Pennsylvania. Several table games dealer training sessions are available, including day, afternoon, and evening programs for both incoming students and experienced dealers. Classes begin on February 23. For more information, call NCC Hospitality & Tourism at 610-332-6580, or go to www.northampton.edu/casino. The Portland Hook and Ladder Co. #1 will hold its eighth annual Liztech Bingo Saturday February 14. Tickets will go on sale soon..
Zumba Gold w/Janis Tues, Dec. 2, 9, 16, 23 10:00 A.M. Craft & Chat, Tuesday, Dec. 2, 9, 16, 23 9:00 A.M.
Brush Away with Senior Artists Wednesday, Dec., 3, 10, 24, 31 8:00-11:00 A.M.
MAKING COOKIES WITH THE GIRLS Friday, Dec. 5, 1:00-4:00 P.M.
Christmas Pictionary Thursday, Dec. 11 10:00 A.M. 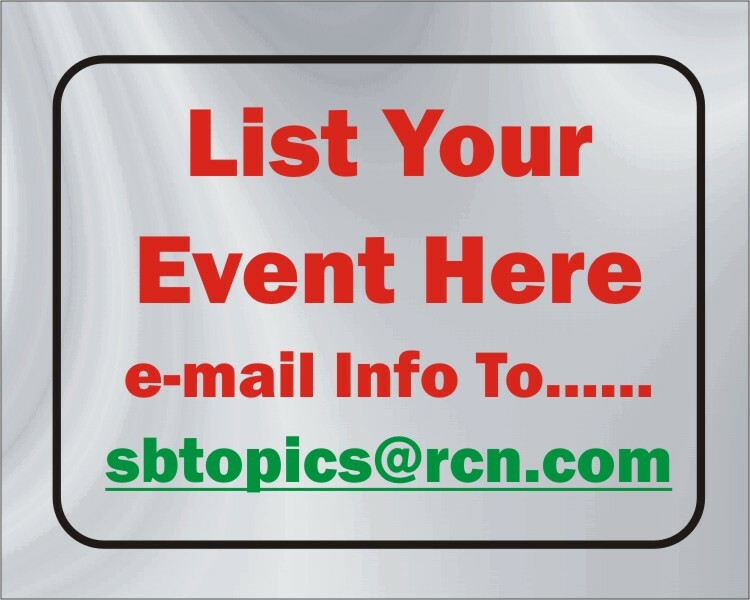 Blood Pressure Thursday, Dec. 18 9:00-11:00 A.M.
Officers Council Meeting Thursday, Dec. 18, 9:30 A.M.
DANCE WITH GARY DEE Thursday, Dec. 18 12:00-3:00 P.M.
Bean Bags Wednesday, Dec. 31 9:30 A.M. This year once again the Columbia Fire Company in Roseto will be conducting their Gun-A-Day raffle in the month of November. As with last year, each day will feature a different gun or a cash prize equivalent. Each day the winning ticket will be determined by the evening PA Daily Number drawn at 7pm. The Fire Company will contact the winner to confirm the ticket and discuss arrangements for prize collection. If you would like a ticket, please send an e-mail with your name, address, and phone number to webadmin@columbiafireco.org and someone will contact you or call the Firehouse at 610-588-0597. Atkins, Ace: Robert B. Parkers cheap shot; Garrison, Paul: Robert Ludlum’s The Janson command; Lescroart, John: The keeper; Taylor, Brad: Days of rage. Bartlett, Richard: The physics of miracles; Calbom, Cherie: The juice lady’s big book of juices and green smoothies; Foley, Leonard: Saint of the day; Hester, Kathy: Vegan slow cooking for two or just for you; Theodore, Laura: Vegan twists on American family favorites; Theodore, Laura: Lively vegan cuisine that’s easy and delicious. Farshtey, Greg: Bionicle Rahi beasts; West, Tracey: A ninjas Path; Rise of the snakes.